I'd buy an iPad just to read comic books. Think I'm nuts? I probably am, but see how you feel after this first look at what Panelfly, maker of a popular comic book iPhone app, is building for the iPad. Instead of simply scaling up the existing iPhone app, the folks from Panelfly put their heads together with the Sugarcube dev team and brainstormed. With all the talk of the iPad and how it could restore comic books to their former glory, they realized that they needed to revamp the app and make a version specifically for the iPad. This way they could take full advantage of the device's screen size and provide a new way of purchasing and interacting with the content. The way the Panelfly iPhone app works is that you download the app for free from the app store and then add comics to your library through in-app purchases. Stephen Lynch, CTO and designer at Panelfly, hinted that the company is currently exploring several different purchase models for the iPad version, but was unfortunately unable to elaborate even when I tried to coax out whether there'd be a subscription option. As far as reading and navigating content on the new iPad app goes, let's just say it'll blow us all away. From what Stephen was able to share with me, Panelfly "didn't want to stray too far from the native Apple UI elements, [they] wanted to create something that was [theirs] as well as a platform that gave the content the respect it deserves." And from the looks and sound of it? They've succeeded. Be sure to click on the images in the gallery for the full-sized view. It's worth it. 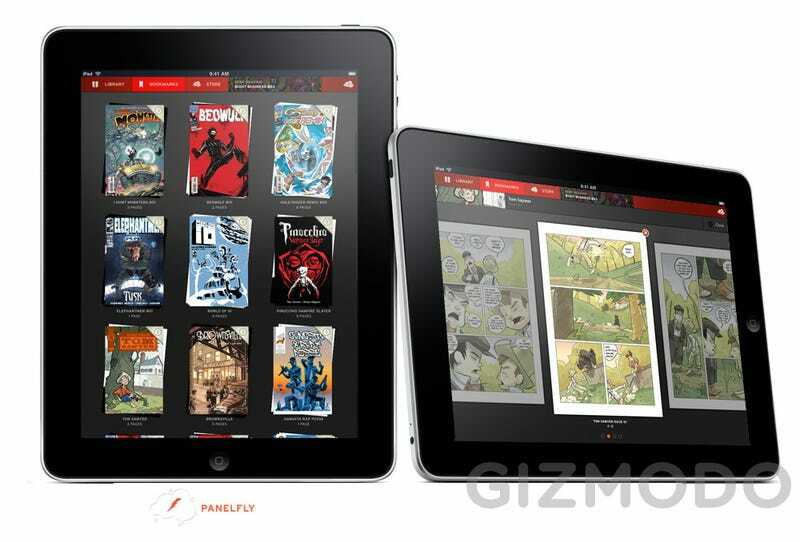 Call me a geeky comic book lover, but apps like this one are what I'm looking forward to when it comes to the iPad. The gadget won't replace my computer, it won't replace my TV, and it won't replace any other device I've got around the house. But it will be what I sit down with when I want to catch up on some comics, magazines, journal articles, and what will be formerly known as "print" media.